It has been 14 years since the death of Jonathan Larson, as well as the Broadway launch of the landmark rock musical he left behind. RENT, for which he posthumously won the Tony Award for Best Musical and the Pulitzer Prize for Best Play, resonated with a younger generation, because of its direct portrayal of queerness, interracial love, economic collapse, addiction, and HIV/AIDS. It signified, despite conventional market wisdom, that mainstream America was not only willing but also hungry for a juicy inquiry into these subjects. RENT, a hip reimagining of Giacomo Puccini’s opera La Boheme, went on to run for 12 years, making it the eighth-longest-running musical in Broadway history. The terrific 2005 film version, despite mixed reviews ranging from glowing to negative, since has found its niche as a cult classic. Locally, RENT has a significant Twin Cities connection. Original producer Kevin McCollum, who became President of St. Paul’s Ordway Center soon after the Broadway opening, brought us its marvelous national tours. Young new theater-goers and stuffy older folks beheld the revolutionary musical together. In the rock sensation’s farewell tour 11 months ago, original stars Adam Pascal and Anthony Rapp played the Orpheum in Minneapolis. The night I attended, the audience went wild! Some criticized the two stars for being too old for the roles more than a dozen years after they premiered them, but for the audience, the experience was utterly visceral, and for some, downright hysterical. However, a new generation here in Minnesota is discovering RENT for the first time, not as an audience, but as the ensemble that actually performs it. Cardinal Theatricals has found a way into the script that cuts right to the jugular of Larson’s deepest-held vision of what the musical is all about. Director Andrew Rasmussen’s actors have made their marks individually in local bands, and some have been homeless—something RENT’s characters must take a stand against. Cast members have played solo acts at First Avenue and Aqua. Some come from bands like Far From Falling, 2 Tone Runts, and Dreamchyld. Soul Cafe fave Jamecia Bennett, who plays lesbian Joanne, was named Lavender’s Best Musical Actress 2007 for Penumbra’s Get Ready. Bucking the odds, Rasmussen’s staging was a hit late last year in ultraconservative St. Cloud for the Great River Educational Arts Theatre. The cast also has performed excerpts for St. Joan of Arc Catholic Church in Minneapolis. 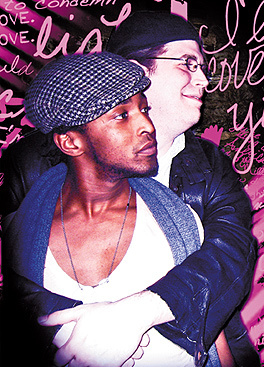 Queer audiences love RENT’s romance between Angel and Tom Collins. RENT challenges Williams because the performer has relatives living with AIDS. Indeed, that comfort level and intimate vulnerability make for passionate theater. Sounds like Rasmussen is onto something by casting actors who are unafraid to get to know one another, and who bravely draw from their own edgy experience outside the mainstream to make RENT the show it’s meant to be. Lab Theater, 700 N. 1st St., Mpls. You may want to check out his fascinating performance in Walking Shadow’s “Mojo” at Red Eye this week and next.